Necmiye Alpay is a Turkish translator, editor, and journalist who has devoted much of her career to improving the quality of written Turkish and is a staunch defender of free expression and a voice calling for peace between Turkey and the Kurdistan Workers’ Party (PKK). 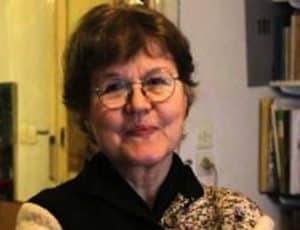 Alpay, who is 70 years old, was arrested on August 31, 2016, in connection with an ongoing investigation into the pro-Kurdish opposition newspaper Özgür Gündem, for which she served as an advisory board member. The Turkish state shut down the paper on August 16 as part of the state of emergency in the country following the failed coup of July 15, stating that the outlet made “propaganda for the PKK,” which is listed as a terrorist group, and acted “as its de facto news outlet.” Necmiye Alpay is currently in jail awaiting trial on charges of “being a member of an armed terrorist group.” Prosecutors are seeking an aggravated life sentence for Alpay and eight other staff members of Özgür Gündem, including renowned writer and activist Aslı Erdoğan. On December 29, 2016, as the trial of those accused in the case started, Alpay was granted a conditional release from detention, and was released that evening under a travel ban. The travel ban was lifted for both Alpay and fellow defendant Erdoğan on June 22, 2017. The next court date is set for October 31, 2017. Necmiye Alpay is a linguist and writer often described as a living dictionary of the Turkish language. A 1969 graduate of the Ankara University Faculty for Political Science, she completed a doctorate in economics at Paris-Nanterre University and returned to Ankara University as a lecturer. While teaching in the Faculty for Political Science, she was arrested by those responsible for the September 12, 1980, military coup, and spent three years in prison. She started working as a translator following her release. She has written columns and articles in newspapers and journals such as Radikal, translated numerous works into Turkish, including those of Edward Said, Immanuel Wallerstein, René Girard, Paul Ricoeur, and Jan Marchand, and has written several books on the usage of language, literary criticism, and the peace process in Turkey. On November 23, 2016, an Istanbul court dropped the charges of disrupting national unity against both Alpay and writer Aslı Erdoğan; however, the terrorism charges still stand, and the indictment seeks aggravated life sentences for Alpay and Erdogan, as well as seven other writers and activists associated with Özgür Gündem. On December 29, as the trial opened, Alpay was granted a conditional release from detention, and was released that evening. As of April, 2018, Alpay is currently under trial against the Turkish government against terrorism charges. A member of the Turkish Association of Translators and the Peace Foundation, Alpay was awarded honorary membership of the Swiss German PEN Center on September 14, 2016.